The Bureau of Safety and Environmental Enforcement (BSEE) & the U. S. Coast Guard have set up a Command Center in their continued response to the loss of well control event 55 miles offshore Louisiana in 154 feet of water in the Gulf of Mexico. 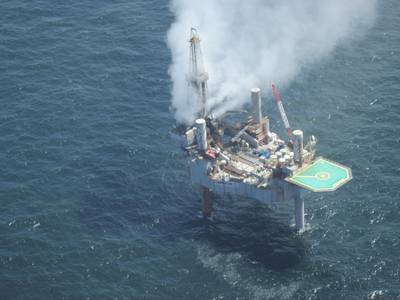 * AM UPDATE: The Bureau of Safety and Environmental Enforcement has confirmed a fire on board the Hercules 265 Rig located approximately 55 miles offshore Louisiana. The natural gas leaking from the well ignited at 10:50 p.m. CDT July 23, 2013. No one was on board at the time of the ignition and no one was injured. The source of the ignition is not known at this time. Walter Oil and Gas Corporation experienced a loss of control of Well A-3 at approximately 8:45 a.m. on an unmanned platform at South Timbalier Block 220 while doing completion work on the sidetrack well to prepare the well for production. The operator reported the safe evacuation of 44 personnel, corrected from earlier reports of 47, from the Hercules 265 jack-up rig. The well continues to flow natural gas. From a BSEE overflight earlier today, BSEE inspectors reported a cloud of natural gas above the rig and a light sheen on the water one-half mile by 50 feet in area that is quickly dissipating. A firefighting vessel is expected to be on location this evening with both water and foam fire fighting abilities. The operator, Walter Oil and Gas Corporation, will be conducting a site assessment prior to beginning any work on the well. BSEE will be reviewing and approving all plans and procedures to stop the flow of gas and secure the well. The U.S. Coast Guard is providing safety management oversight and have deployed the following resources: the 87-foot Coast Guard Cutter and crew Pompano, one MH-65 Dolphin helicopter from Coast Guard Air Station New Orleans and one HC-144 Ocean Sentry from Coast Guard Aviation Training Center Mobile. BSEE will be conducting an investigation into the incident's cause.